Various comic news sites, forums, and social media have been aflame with comic fans debating just how this will affect Comixology and digital comics in general. Will Comixology continue on its course? Will Amazon just ruin things, as some people think? What does this mean for the Submit program and digital self-publishing? Lots of questions, but not lots of answers at this point. But, that doesn’t mean that people still aren’t talking. 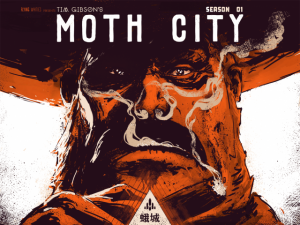 To maybe get a better idea at what this deal could really mean, I talked with Tim Gibson, creator, artist, and writer of Moth City. Moth City was one of the early releases on Comixology Submit and one of the success stories, taking Moth City from a self-published webcomic to one of the most sold Submit titles in 2013. Tim is a wealth of opinions and ideas on the subject of digital comics, so it was only right to chat with him a bit about the big news and what he thinks this could mean for Amazon, Comixology, Comixology Submit, self-publishing, and much more. Leo Johnson: I know I’m pretty excited about the potential that the Comixology/Amazon deal has, but that’s just as a consumer. For you, as a creator who has multiple comics on Comixology through the Submit program, what does this move have you feeling? Tim Gibson: It’s really hard to tell until more details come out, but I don’t think it’s bad news. It could, in fact, be awesome news. LJ: Amazon is a large marketplace for lots of trades and GNs, largely in print. But digital comics have never really been a big thing there for multiple reasons. Do you see the Comixology/Amazon deal getting digital comics to Amazon more easily? TG: I think digital comics and graphic novels on Amazon had a few problems, the files are not as hi-resolution as you might like, the Kindle Fire never had enough pixels, and they had some weird ‘delivery fees’ that basically punished creators who wanted to upload longer works, or digital-native comics like Moth City. Creators there weren’t on an even footing with traditional writers, and reacted accordingly. I think if they listen, they’ll learn a lot from the Comixlogy Submit team about the above, which won’t be a bad thing. That said, you hear rumors of a pretty big backlog of comics awaiting approval via Submit, so there are some side effects to doing everything with care. LJ: Again, with the large print market that Amazon has and the veritable stranglehold that Comixology has on digital, there’s lots of possibilities. What would you most like to see come out of the (hopeful) at least partial integration of the two services? Maybe one-touch purchases for trades after you finish the digital issues? TG: A single submission that gets you on both digital store fronts would be great. Synced reviews across both platforms, and integrated sales charts (meaning sales on Comixlogy also effect a book’s ranking on Amazon) would be cool. Comixology also has a nice ‘buy the next issue’ button when you finish a comic on an iOS device which is helpful, and would be a nice idea for Amazon to steal. One-click trade orders is a good idea, especially for bigger publishers, but my pipe-dream would be an integrated one-click Print-On-Demand (POD) service for indie creators. I always imagined this happening though a comics-specific POD supplier like KaBlam, but Amazon’s POD company, Createspace, seems to be gaining an improved reputation for quality, in fiction books at least. LJ: As a creator in Comixology’s Submit program, and arguably one of the more successful ones, do you see this affecting Submit or your sales in any way? TG: Not in the short term. I think if you’re aware of digital comics you’re already using something like Comixology, iVerse or DriveThruComics. It’ll be presenting a better option to Amazon’s normal readers and shoppers that has the potential to lift sales. LJ: Submit is a bit selective in which indie comics they publish, while Amazon lets essentially anyone put up ebooks. If Submit moves towards the Amazon model, how do you see this affecting things? Are more maybe not-so-good comics a bad thing, or is more comics, more exposure, more (potential) readers a good thing? TG: I wrote a blog post a while back called ‘Disposable is Not a Dirty Word‘ where I argue that digital can be the new pulp-fiction, and that more creators, charging less but earning more with access to more readers is always better in the long run. A lot of our best fiction writers cut their teeth on dime novels and pulp. Diversity is something that people write about in comics journalism a lot, but it often comes off as lip service. If we really want to provide all kinds of stories for all kinds of people we have to let the barbarians through the gate, which will terrify us initially. Comixology Submit lets us (I’m including myself here) in, but they pat us down and enforce a strict dress code before letting us through which keeps their more conservative readers happy. Just cause every high-school kid is in a band doesn’t mean you have to go listen to them, if you know what I mean. LJ: You’ve talked about Amazon and their format and what it could do for comics multiple times on your blog. Obviously, you’ve given this idea some thought already. Long term, what do you see the big impact being? What about short term? TG: Short term I don’t think we’ll see any urgent changes from either store-front, though it might encourage some creators who have been dragging their feet on digital to get a move on. There’s a lot of them. Long term this could be very, very good for comics. I don’t believe in suffering for your art, or that you only love something if you do it for free. Simply, if it’s easier for writers and artists to make money from their comics, then not only will they be able to spend more time drawing than flipping burgers, but it’ll encourage kids to get involved and provide you with awesome stories when I’m a washed up old hack. On a personal note, and as a consumer of comics from both Amazon and Comixology, this could be HUGE. I imagine the Comixology crew are a bit too smart to move like this into something that will harm the Comixology brand and the high quality that users have come to expect. While there has been a bit of joking speculation on Twitter of being able to read a comic on the app and then having an Amazon drone airdrop the trade on your house, that may be a few years off. What I am looking forward to is more interactivity between print and digital between these two sites, making it even easier to move from print reading to picking up digital titles, or vice versa. If Tim’s pipe-dream is a great, one-click POD service for digital comics, then mine is an Amazon Affiliates style program for Comixology, where comic sites can direct sales to Comixology and get a little kickback. The small and medium traffic sites, where there are definite views but not much money being made, could benefit, earning even small amounts to make the site more self-sustaining and less a selfless labor of love. All in all, this is a big deal. Comixology + Amazon = (probably) something really cool. As more details come out about the nature of the move and how it will affect both companies, fans everywhere are sure to continue debating just how good a move it was.